It’s International Women’s Day. As expected, restaurants and other businesses around town are participating in the #ADayWithoutaWoman strike. Even the Statue of Liberty took last night off in solidarity. To find out how you can join in, see our roundup of today’s events. We’ll have more coverage later; in the meantime, here’s what’s happening on social media. Opening Wednesday March 8 at The Living Gallery, 9 pm. One night only. If you’re a woman creator, walk yourself over to The Living Gallery this Wednesday for the International Women’s Day edition of their recurring BYO Art exhibition. The idea behind BYO Art is simple: just bring your art to the gallery and set it up. If there are any interested buyers present, you’ll get the full amount without the gallery taking a percentage. Since the art present will be contingent on who arrives with stuff they’ve made, there’s really no telling of what you’ll see. It could be something amazing. 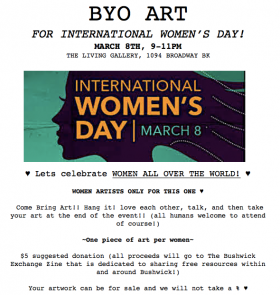 This BYO Art is for women artists only in honor of Women’s Day, and will also host a variety of live music and poetry performances starting at 10 pm, including a short set by my band Squidssidy, so come say hi. Anyone can come, of course, despite the creators being only women. The event requests a $5 suggested donation that will go toward the Bushwick Exchange Zine, a publication dedicated to sharing free resources in and around Bushwick.